The “Volunteer weather reporters in the USA” story contained the RSID experiment. Apparently, some listeners have had problems with Fldigi resetting the frequency used while decoding, leading to decoding failures. The thought was that some of the problem might be due to users setting their recording volume levels too high. I have never had a problem with the decoding frequency resetting, but I did try the volume level test that Kim Andrew Elliot recommended. I was surprised to find that I have probably been setting the volume, not too high, but much too low. I increased my recording volume significantly as a result. I decoded three of the VOA Radiogram broadcasts this weekend, although this is probably the last weekend I will try that now that we are in Daylight Saving Time. Here are the images I decoded Saturday at 1600 UTC (Saturday at 11:00 AM EST) on 17860 kHz. I had very good results with this broadcast this weekend, which is normally difficult to receive here. I don’t know whether it was due to better reception conditions or if setting the volume higher did the trick, but the image decodes were quite good. The final image isn’t an image at all, but an unusual text mode known as Feld-Hell. It was invented in Germany in the 1920’s for a teleprinter named the Feldhellschreiber. The Feld-Hell mode broadcasts text as images, with each line repeated for redundancy. There was a glitch during transmission of this broadcast and a portion of the first few minutes was missing. This meant that I was unable to decode the first image. The remaining images suffered from excessive interference, but I think that some of that was from my computer itself. I may have to look into purchasing an audio isolator to shield the radio from the computer. These were excellent image decodes, perhaps the best I have decoded. The picture of Broadcasting Board of Governors CEO Andrew Lack (the third image) was especially clear. VOA Radiogram wasn’t the only image decode I attempted on Saturday. 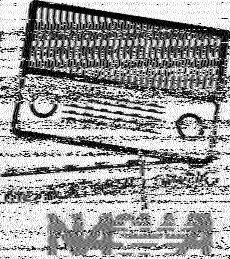 I also decoded the MFSK64 image from “The Giant Jukebox” show on The Mighty KBC. I wrote more about that here. 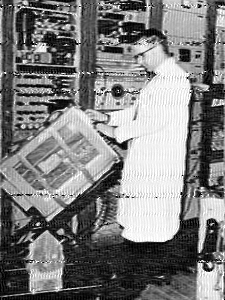 In addition, I decoded the MFSK32 image broadcast as part of the special Shortwave Shindig program broadcast by WRMI on 7570 kHz. My reception of the Shortwave Shindig wasn’t very good, and the decode of the image was pretty mangled near the bottom.